Yes, really: grilled (make it like you would a grilled cheese, but put on peanut butter and jelly instead). Think back to your childhood food experiences, and the people that lent their recipes and kitchen craft to your food story. Some good, some bad? My own food saga includes an incident, when my father took us [kids] fishing. Barely arrived, we gleefully gobbled too much licorice and sipped countless cups of hot chocolate; hours later our indulgences shook hands with the flu. Suffice it to say, it wasn't pretty. And to top it off, we were camping next to wildly successful [slurring, partying and passing out] fisherman, with only a single porta-potty inside a camper van, in the middle of nowhere. Today we tell the story and laugh hysterically, generously buffered by the gift of time passed. On the happier side of food memories, I fondly remember the pink peppermints my grandma slid me, or the white rice she magically turned into a mountainous pudding, floating in a lake of butter and brown sugar. And I will never forget when---as a newlywed---I was learning how to cook, and put in over 20 cloves of garlic instead of the called for 2-3. It turned a small, humble batch of pesto into a green garlic paste and WOW it packed a punch: every pore I had smelled like garlic cloves every minute of every day for a week. The PB&J is less of a story than a singular event that occurred when I was 5. Before then, grilled only meant cheese and peanut butter and jelly had never met the skillet. But on this particular day it did, and the standard sandwich was transformed. My curiosity toward food was awakened. Here is how I remember it: I spent a single day with a fill-in caretaker, an elderly friend of the family. When lunch rolled around, she announced the entree: Grilled PB&J. With curious eyes and absolute disbelief, I peered over the edge of the skillet. As if breaking all the rules I bit into this divergent sandwich: it was gooey, crisp, warm, cool and sweet all at the same time. On that day, on some level, I discovered that when it comes to food you can change the rules. Just because I only had grilled cheese didn't mean that was the same everywhere else. When it comes to food, each family has different stand-bys, secrets and snack drawers. I later noticed my friends' lunches and how each one was different. I went on playdates and noted that snacks and dinners and desserts took a unique shape of their own, based on family customs. Today this intrigue shows up as I watch people pile food from their grocery carts to the cashier; each pile uniquely based on the individual, the family, and what is cultural or customary. 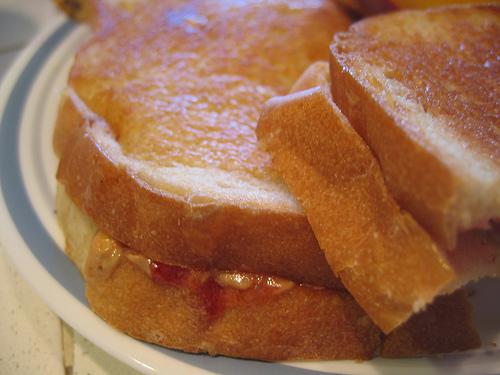 It probably owe thanks to the Grilled PB&J for my insatiable desire to reinvent the rules of the kitchen. Slicing apples the opposite way of 'normal,' taking the potatoes out of the oven and to the grill, searching for the next great lunchbox food for my kids, daring myself to attempt canning and/or to fry zucchini blossoms for the first time. It is that knowledge that just because I learned one way doesn't mean there isn't another. So I lean over the shoulders of my neighbors and ask the grocery line bystander what are you making with such an interesting array of ingredients? Don't get me wrong, I love the familiar favorites of my family. When I go to the store 90% of what I buy I have bought before. But I always try to add a few new things to the cart, or inject a new recipe from my magazine file. My favorite discoveries might be the shortcuts, like pesto in ice cube trays or making bread crumbs and then freezing them for future use. Food is a story I enjoy, a quintessential adventure where I can embrace all that is familiar and at the same time break all the rules.